Swahili Time: Mwanamke MKenya Ajarubu Kuibia Benki Texas! Wadau, huyo dada MKenya alijaribu kuibia benki Texas! Ni bahati hakuuawa na polisi! Alitumia mtoto wake wa miezi tisa kama ngao! Atapata kifungo si chini ya miaka 20! 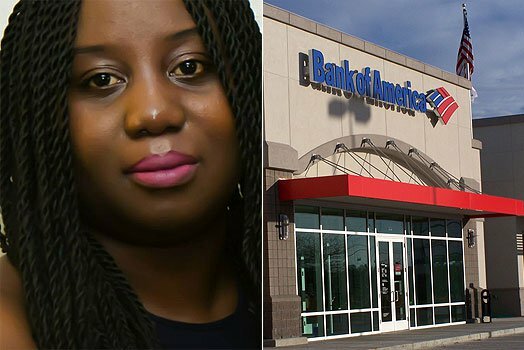 A Kenyan woman was on Wednesday arrested after she walked into a Texas bank and tried to rob it. Police say the suspect, identified as 36-year-old Evelyn Misumi, walked into a Bank of America branch armed with a hammer, gasoline and lighter fluid. According to local police, Ms Misumi poured gasoline and lighter fluid on the bank’s lobby and demanded cash from the tellers while waving a hammer. Murphy Police said alert tellers and office personnel called 911 and when the officers arrived on the scene, the 36-year-old suspect was heading out of the building towards her car. “Police elected not to draw weapons as no immediate danger to themselves or surrounding individuals was apparent,” the department said in a news release. Police said when she reached her car, she pulled a small child out of the vehicle and attempted to use the child as a shield. After a brief standoff she eventually surrendered. She was taken to the Collin County jail where she remains in custody and faces charges of robbery and endangering a child charges. Investigators are working to determine if the child is related to Misumi.